Homepage. This page: Old photos of the pre-war 8hp Ford sidevalve. 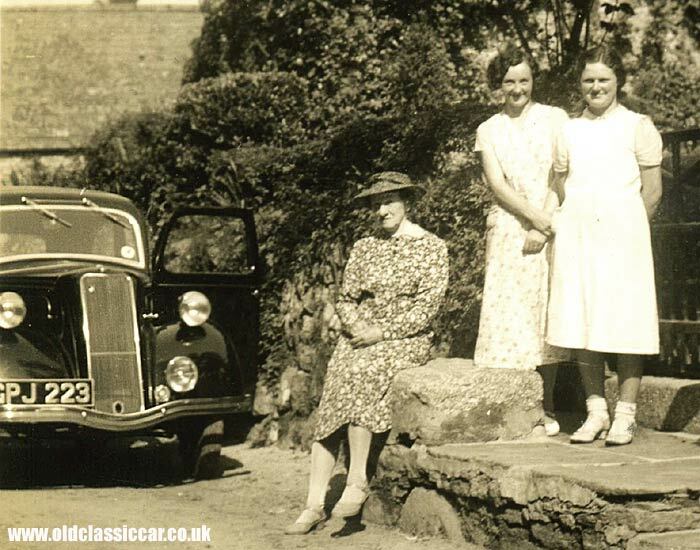 Firstly, another period Ford photo from Les' extensive photo collection, this time of a late 1930s sidevalve Ford. Judging by the non-beaded edge to the wings, I think this is a 1937/39 7Y, fitted with the 8hp version of Ford's sidevalve motor. It was in effect the 'bargain basement' car in Ford's model range, taking over from the earlier 8hp Model Y. Buyers could choose from a standard saloon, a De Luxe, and a small 5cwt van. Australian buyers could also opt for a tourer or roadster version, perhaps more suited to their climate. All 7Y Fords were powered by the four cylinder all-iron 933cc 'Eight' sidevalve engine, with thermo-syphon cooling, coupled to a three speed 'box. The car shown below is a De Luxe version of the 7Y 'Eight', and looks to be fitted with a wireless. In 1939 the 7Y was replaced by the E04A Anglia. 2. Another 7Y De Luxe saloon. 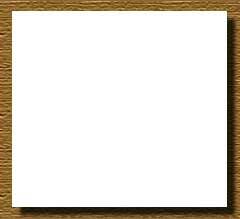 Next is a photo from my own collection. It shows a 7Y Eight from the front this time, along with some ladies of mixed vintage. The dip in the bumper is a throwback to the long-rad Model Y. Again this is a De Luxe model, sporting an opening windscreen with a chrome-plated surround. It also has a factory-option single fog lamp, fitted to the nearside only. GPJ 223 was registered in Surrey. 3. A base model 7Y Ford? 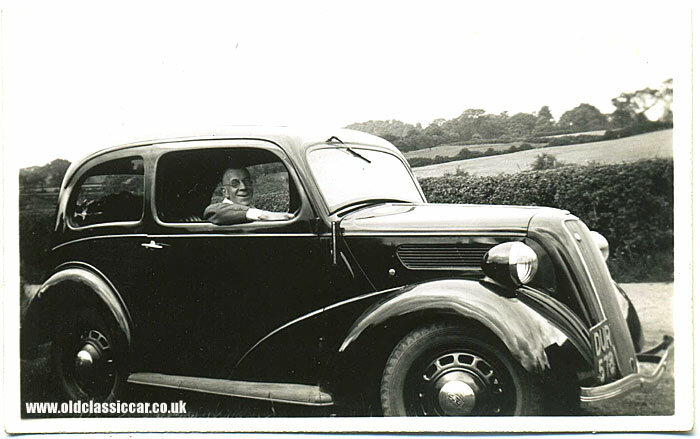 This photo shows another Ford 7Y, registration DUR 578, a Hertfordshire series first used in 1938. A note on the back suggests that the driver is a Mr Harold Westcott, and the location is given as Smethwick, Staffordshire. This looks like it could be a base model Ford 8, note the single screen wiper (those shown above have two), and the lack of shiny trim around the bonnet side vent. This one has however been upgraded with pop-up semaphores, or "trafficators", mounted externally just ahead of the doors. 4. Ford 7Y registration ELE 89. 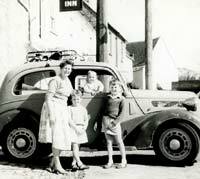 Graham emailed these photos over, hoping that his Grandfather's car could be identified. The car's registration was ELE 89, a London issue used from October 1937 onwards. 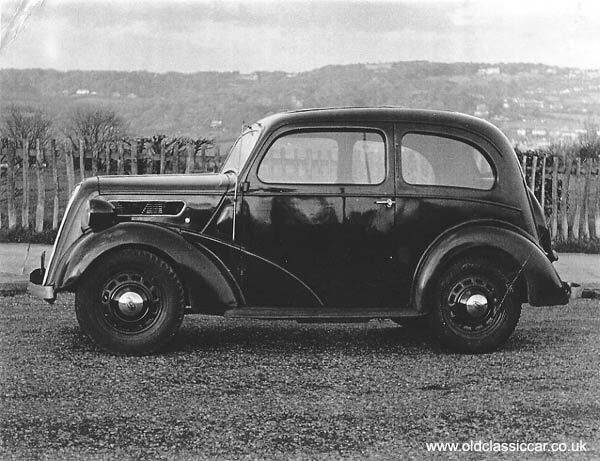 As more photos came to light and were sent over, it became clear that the Ford was a 7Y De Luxe saloon. 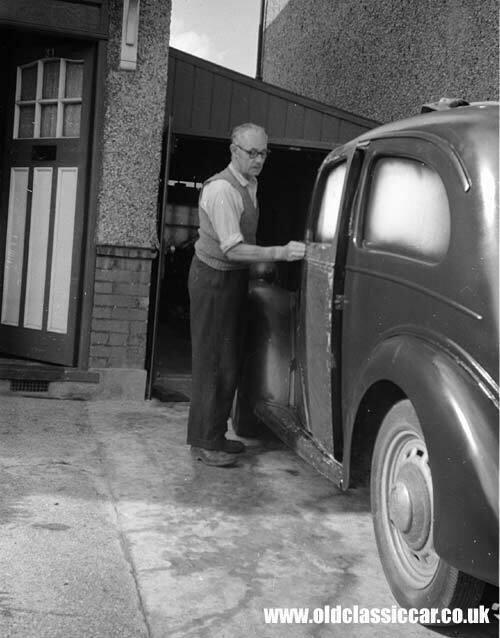 The first picture shows his Grandfather in the middle of repainting the little 8hp Ford - note the windows masked over, the partially-repainted side of the car, and the door, minus doorhandle, being rubbed down. He also has a faded purchase receipt for this pre-war Ford 8, which read: "43 Butler Avenue, Harrow. Received the sum from Mr Leach 31 Warham Road Wealdstone the sum of 90 GBP for Ford Reg No ELE 89 as seen tried & approved. George Bennett pp P Bennett". Unfortunately it isn't dated. A look in a price guide for April 1939 gives a valuation for the 7Y of around this figure, suggesting a purchase shortly before the war. The following photographs again show ELE 89, this time on a camping trip, parked with a pre-war caravan which presumably they'd rented. This front view of the 7Y Ford confirms it as a De Luxe model (twin wipers, opening screen etc). The small circular badge alongside the AA item on the grille is '8' (for Ford 8). Also interesting is the while paint applied to the running boards (a feature found on early 7Ys only), and the wing edges. This ties in with a London-registered car being used during the hours of black-out during WW2. No headlamp mask is fitted, so perhaps this photo was taken shortly after the war. The caravan is parked on quite a slope, judging by how extended the corner steadies are. Note the old-style Calor Gas bottle. Graham also turned up this photograph of the car and caravan together. And finally in this set, a rear view of ELE, again parked at the campsite. Note the enclosed spare wheel cover, and other caravans in the background. Thanks again to Graham for allowing these great photo to be shown here. 5. A different 7Y on a family's picnic. Three ladies are in shot with this next Ford 7Y. Registered EWA 381, this car first hit the road late in 1937, or early 1938. The single wiper and lack of trim around the bonnet vents, confirms this as a "base" model 7Y. 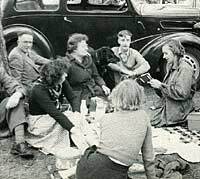 The picnic dates to the post-war era, as evidenced by the E493A Prefect parked in the background. 6. More food, and another 7Y. 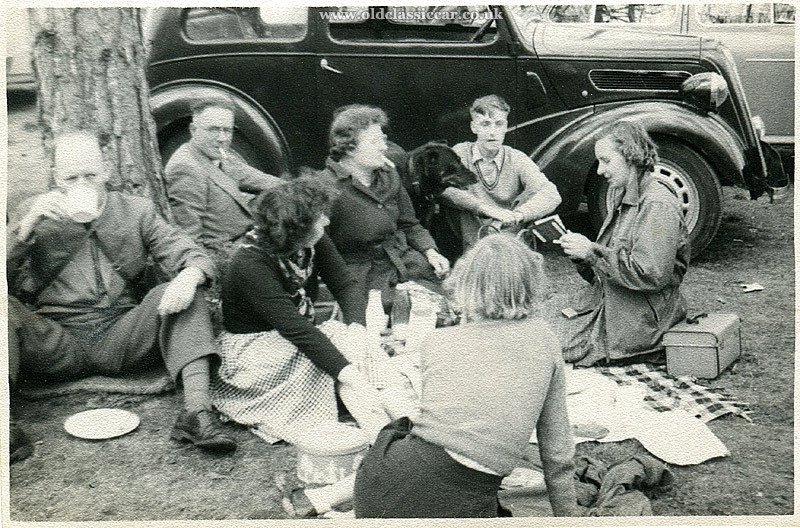 Picnics continue to feature in many of the old photos that turn up. Here, another family is shown tucking into their food (and cigarettes) alongside a black 7Y Deluxe. While the car is pre-war, the scene looks to be from the 1950s, if the style of the car parked alongside the Ford (it looks like a 1954-on Morris Oxford Series 2) is anything to go by. The location is Wells, in Somerset. 7. 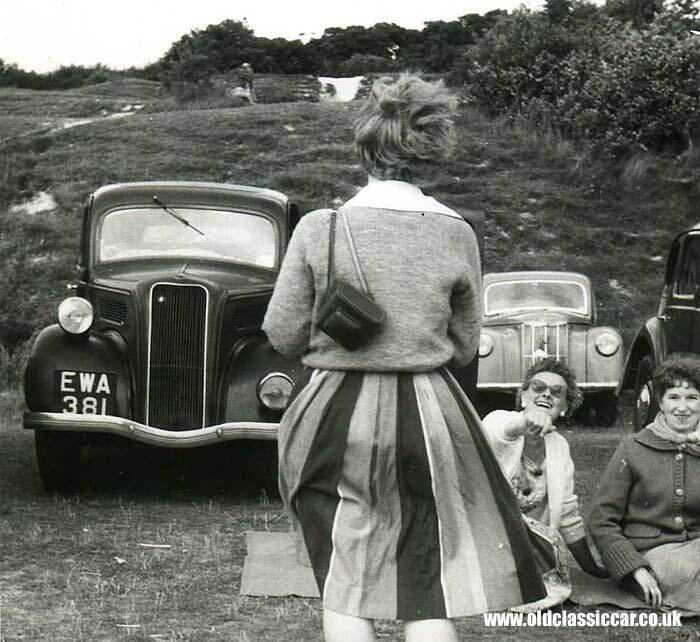 Holidaying with a pre-war Ford in the 1960s. This side-on view of a pre-war Ford 8 was provided by Steve Greenaway (thanks). 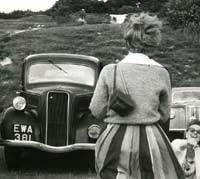 His father borrowed the Ford in the 1960s to use on a family holiday. By this point in time, the Ford was beginning to show its age. Eagle-eyed Ford aficionados will spot that the rear wing has the correct, non-beaded, edge, while the front wing - presumably a replacement from a later model - does have a beaded edge, and also a non-original headlamp bolted to it. Giveaways that this is a 7Y rather than a more common 103E Pop, include the rear wraparound corner bumpers, and the spare wheel sited on the rear panel beneath a metal cover. Pops don't have running boards or ring-type bonnet catches either. 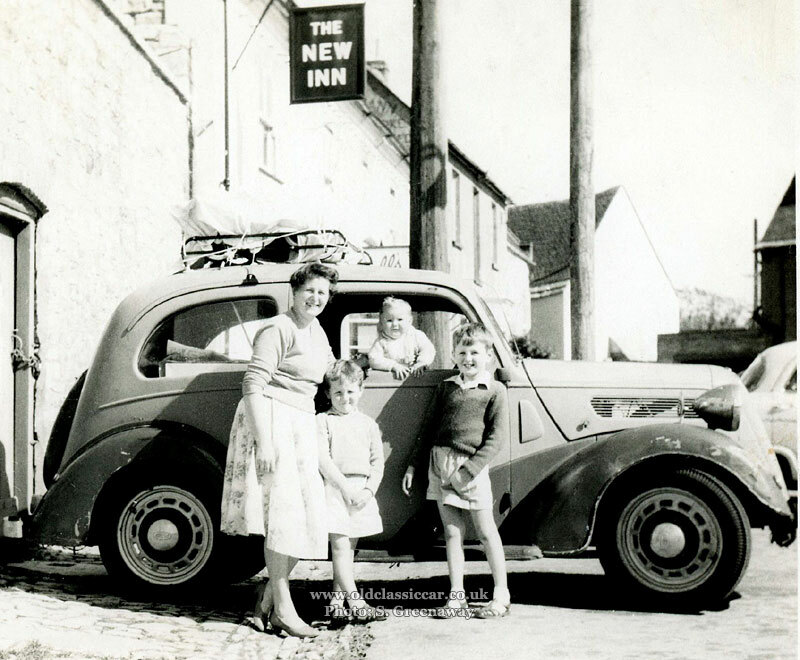 It was a sunny day when the car was caught on film, parked outside The New Inn. Great photo, thanks Steve! 8. More picnic fun with a 7Y Eight. Nick kindly sent over this old family photo, it features a Ford 7Y Eight captured - as many photos on this page were - on a picnic. "I had been struggling a bit to identify this Ford, which I remember from my early youth. I nearly convinced myself by comparing pictures elsewhere that it must have been a Ford Popular 103E. But its owner at the time of this photograph, which probably dates from about 1955, was my uncle and he was a motor-fitter all his working life. He never referred to it as anything other than a "Ford Eight", and he must have been good at knowing which model was which." 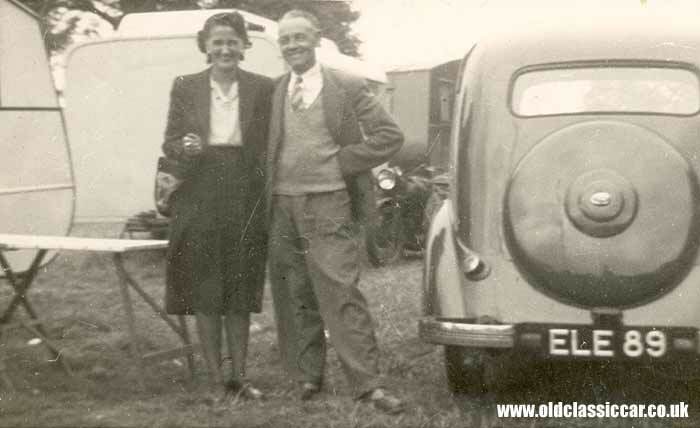 "Long story shortened etc., I found pictures of other Model 7Y cars on your website, and my uncleâ€™s clearly was a Model 7Y with its very solid bumper bar and not the successor E04A Anglia from about the same time, or the 103E. The registration was HPU 910 (small-boy photographic memory kicks in) and that is consistent with it being registered in Essex just before the start of the Second World War." "My family told me that when the war led to severe shortages of petrol for domestic use, the price of cars fell dramatically, and so owners (and maybe speculators) would jack them up and leave them on blocks so that the tyres would not become mis-shapen, hoping to bring them back into use whenever petrol became available again. 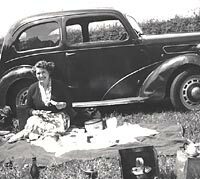 My uncle worked at a Vauxhall agent and it was his custom to run a big car, I think a Vauxhall 12 or 14 (but I was then too young to remember much about it), until he got married to my aunt, the woman in the Ford picture. Then the pressure of running a household must have been the reason he downsized and started to own much-less prestigious cars; I remember that he talked about having to cut the running costs." "Working at a garage, he probably picked up this old Ford for a song, already 15 years old maybe; there's obvious collision damage or similar on the front wing, which he must have got repaired, because I do not recall any of his cars showing damage. It's got a spotlight, though, so this must have been a DeLuxe." "By coincidence, the picture on your website of Model 7Y registered EWA 381 shows it parked next to an E493A Prefect, which was the next Ford my uncle owned (registration VNO 334). Then you go on to say "More food, and another 7Y". 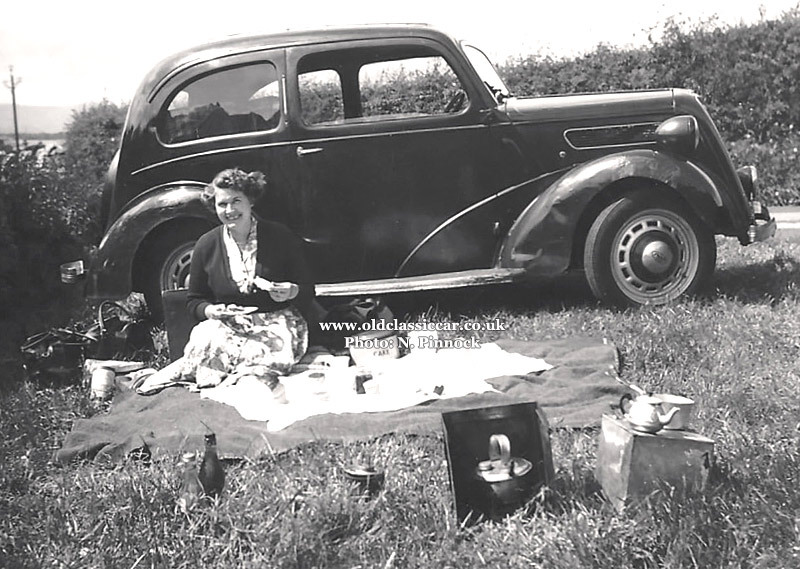 Just look at the picnic paraphernalia in my picture: My aunt is sitting on a reversible waterproof groundsheet, effectively a thin blanket with a rubberised membrane on the underside. This was dual-purpose and also used for many years to help secure the load on a roof-rack, waterproof side out, for obvious reasons. And everybody had storage tins labelled "Cake" in those days. But it's the collapsible windbreak around the methylated-spirit stove that I like particularly; three sheets of metal secured into this open-sided cube using four wing-nuts, and the whole brew-kit fitted for transport into that box with the teapot and saucepan on it. I don't think they ever went anywhere without it all." Marvellous memories you have of the Ford and rides out in it, Nick. Great stuff. HPU dates to the car to mid-1939 - unlike other examples featured, the wipers are mounted below the screen. Photos of a 7Y bombed during WW2, can be found on this page. Period advertising for the 7Y Ford. 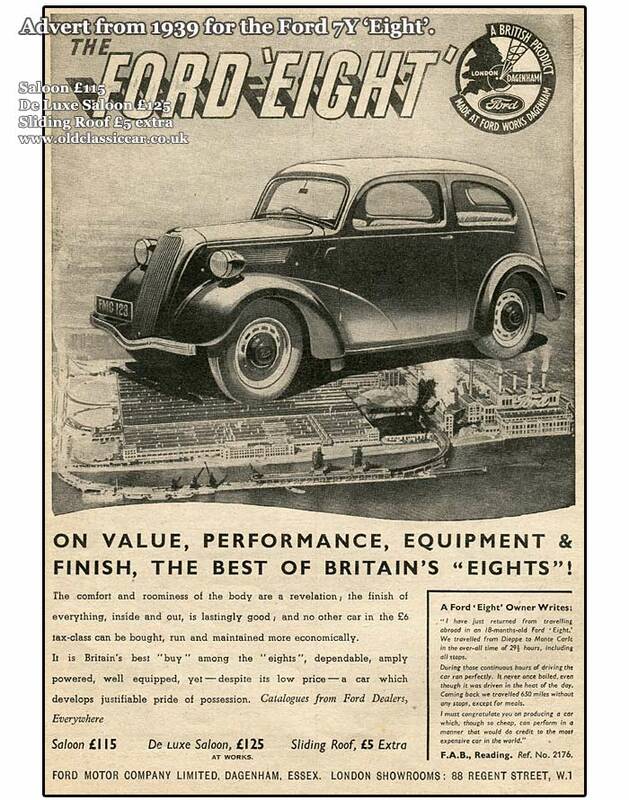 "I have just returned from travelling abroad in an 18-months-old Ford 'Eight'. We travelled from Dieppe to Monte Carlo in the over-all time of 29.5 miles, including all stops." During those continuous hours of driving the car ran perfectly. It never once boiled, even though it was driven in the heat of the day. Coming back we travelled 650 miles without any stops, except for meals." "I must congratulate you on producing a car which, though so cheap, can perform in a manner that would do credit to the most expensive car in the world."